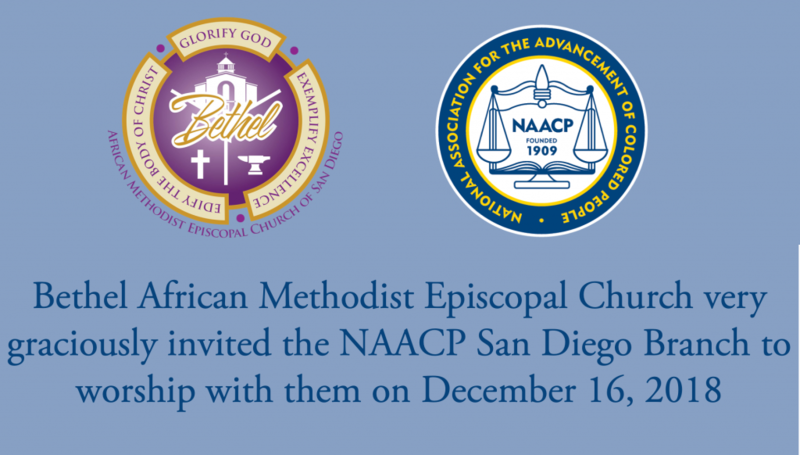 Bethel AME Church very graciously featured the NAACP San Diego Branch at their service on December 16, 2018. We recently received permission to post the program from that service, which was lovely! We of the NAACP San Diego continue to demand all relevant information and video recordings to be released to the McNeil family. We are glad to add our voices to those of Ms Tasha Williamson and other community members who are demanding transparency on the part of the National City Government. With the gracious assistance of Ms Williamson, we offer the following timeline of events, so that you can better understand the evolving situation in National City. Please note: at the end of this timeline, there are several events listed in which you may participate if you are as outraged about the treatment of Mr McNeil, his family and members of our community as are we. Mr McNeil calls for assistance using the emergency phone outside the National City Police Department. Mr McNeil is detained and placed in a restraint device called “the wrap.” He is detained in the lower level parking garage of NCPD Station for an indeterminate length of time. San Diego County Jail refuses to accept Mr McNeil, citing unconsciousness. Mr McNeil is admitted to UCSD Medical Center Trauma Care Unit with massive brain and neurological damage, as well as facial abrasions and swelling. Mr McNeil’s family is contacted by NCPD and told Mr. McNeil had a heart attack while restrained in a hogtie position. Mr McNeil’s family posts to Facebook seeking assistance. Other users refer them to Tasha Williamson and Aeiramique Meeka. Mr McNeil’s family holds joint press conference with Ms Williamson and Ms Meeka at the steps of the San Diego Hall of Justice. Mr McNeil’s family, after conferring with Mr McNeil’s physicians, decide to withdraw life support on June 7th. Mr McNeil’s family seeks legal counsel from Francisco Aldana and Mark Lane. Mr McNeil’s family, supported by Ms Williamson, Building Justice, CAST, Generation Justice, Justice 4SD33, SURJ, Women Occupy San Diego, Racial Justice Coalition of San Diego, CAIR and other community members hold a press conference across from the UCSD Medical Center, demanding an accurate account of Mr McNeil’s hours in custody, and release of all video recordings by the National City Police Department and the San Diego County Sheriff’s Department. NCPD makes first public statement regarding the fatal in-custody injuries of Mr McNeil. UCSD Medical Center staff withdraw life support from Mr McNeil. Mr McNeil shows signs of distress, and is sedated to preclude the posssibility of suffering. Mr McNeil’s family and community members keep vigil over Mr McNeil. Community members and organizations supporting Mr McNeil’s family holds press conference in front of National City Police Department, again demanding an accurate account of Mr McNeil’s detention and release of all video that might shed light on his injuries. GoFundMe created for Mr McNeil’s funeral expenses. Mr McNeil’s family walks out of the meeting due to disrespectful demeanor of Chief Manuel Rodriguez. Ms Williamson, Dwayne Harvey and Marcus Boyd meet with National City Manager Leslie Deese and Mayor Ron Morrison at 2:00pm to discuss timeline of events and the meeting between Mr McNeil’s family and Police Chief Rodriguez. Community members and organizations supporting Mr McNeil’s family meet with media to demand the resignation of NCPD Chief Manuel Rodriguez for his unprofessional conduct with Mr McNeil’s family and his inadequate answers to their questions. Community members, many of them organized by Ms Tasha Williamson, visit the National City Council Meeting to ask for release of evidence surrounding the case. Ms Williamson is arrested for speaking over her time, and is briefly hospitalized for injuries sustained during her arrest. Mr Rafael Bautista is kicked repeatedly by National City Peace Officers while he was coming up the stairway they were going down with Ms Williamson. The NAACP San Diego Branch Executive Committee passes a motion to join in the demands for release of the evidence to the McNeil family, and to offer assistance to Ms Williamson in her defense. Mr McNeil’s funeral Christian Fellowship Church. Deputy District Attorney Handler was in attendance. Community members visit the National City Council Meeting, to demand release of evidence surrounding the case. These include Ms Williamson, NAACP San Diego Branch President Dr André J. Branch, and other members of the NAACP. Assemblymember (and NAACP member) Shirley Weber attends and calls for greater transparency. Mayor Ron Morrison asks the NCPD to remove Ms Williamson. Community members surround her, and the NCPD allows the community to walk her out. What Happened to Earl McNeil? Facebook page created. Abolish ICE/Justice 4 Earl McNeil hunger strikers hold press conference and launch of hunger strike for July 10th – July 23rd. Community members visit the National City Council Meeting, again demanding release of the evidence. NAACP members Amie Zamudio, Steve Dorner, and Renita Payno speak. For the first time, two councilmembers break ranks and call for greater transparency by the city they represent. After the public comment period, the meeting is declared out of order and adjourned to the following afternoon. The National City Council Meeting resumes. Three people are arrested and two (Aeiremique Meeka and Mark Lane) are injured by the NCPD. Everyone is asked to leave the building. The crowd waits to ensure all community members emerge safely, including those arrested and injured. The National City Council declines to add an agenda item addressing Mr McNeil’s death to their agenda. Local reporter Wendy Fry (NBC7 News) reports that “BLM will begin to stage riots in the streets of National City.” NBC7 apologizes for the false statement and deletes it from their website. Community outcry regarding Ms Fry’s reporting continues. Ms Fry condemned for her unjustified alarmism, which further endangers black and brown people. Community members point out that the only assaults caught on camera were those perpetrated by National City Police Officers. National City Council resumes its meetings and public speakers speak out about Earl McNeil and the way people are being treated during arrest. Mark Lane goes over his time and is escorted out by NCPD. Mr McNeil’s autopsy results are “unsealed” but still not made public. These results are claimed to indicate the presence of a controlled substance and that injuries were due to cardiac arrest. At the final National City Council meeting before the August recess, community members are greeted by Sheriff’s deputies in riot gear. At the meeting, six community members, including Tasha Williamson, Aeramique Meeka, and NAACP member Amie Zamudio stage a “die-in” to demand release of the evidence. They are all arrested. There is a marked difference in treatment; the white protesters are handled gently, and the black and brown ones are treated roughly and painfully. Community members are released from jail and welcomed by the community. Ms Williamson is again treated for injuries sustained during her arrest. In a meeting organized by Mark Lane, NBC7 News Executives meet with organizers for Justice 4 Earl McNeil. Executives apologize for Ms Fry’s reporting and pledge to improve relationships with and reporting on black and brown communities. Ms Williamson speaks at Raul Rivera March and Rally for Earl McNeil. Sheriff Bill Gore requests to meet with Mr McNeil’s family and their attorneys. The Sheriff’s Department indicates they wish to work with the family to avoid further outrage and respect their need for information. NAACP holds a Prayer Vigil. Members of the clergy, laypersons, and all persons of good will are invited to mourn and pray with us over the in-custody deaths of African-Americans like Mr McNeil and all the other injustices that are visited upon our community. Public comment at CPRC (National City Police Review Board). Public attendance requested. Town Hall for National City Residents to speak with officials from the National City Government and Police Department. National City Council Meeting. Strong public attendance requested.